The WAGGGS-Asia Pacific Region is the divisional office of the World Association of Girl Guides and Girl Scouts, headquartered in Makati City, Philippines; Australia; and Japan. The WAGGGS-Asia Pacific Region services Guiding in the land area of Asia south of Russia-in-Asia and the bulk of the Pacific Basin. All the formerly communist states of Central Asia and the Soviet Union have developed or are developing Guiding in the wake of the renaissance in the region. For several years, communism repressed Guiding in Afghanistan, where it has newly returned, as well as in Mongolia, which had been the first Soviet satellite state since 1924. 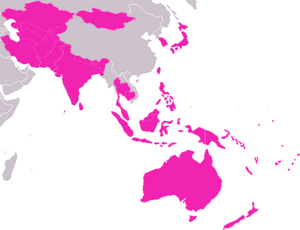 This region is the counterpart of the Asia-Pacific Region of the World Organization of the Scout Movement (WOSM). There is no WAGGGS Region corresponding to the World Organization of the Scout Movement Eurasian Region; postSoviet nations are divided between the WAGGGS-Europe Region and the WAGGGS-Asia Pacific Region. This page was last edited on 27 December 2009, at 03:27.